materials, just like “custom” cabinet and the turnaround time to our warehouse is only four weeks. 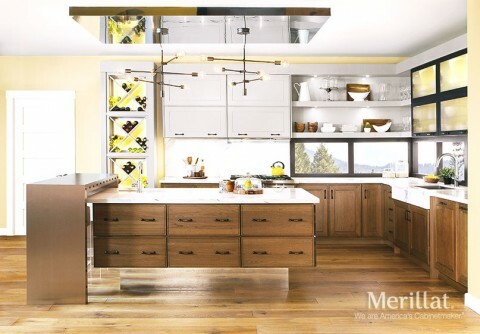 The limited lifetime warranty also tells you that Merillat will stand behind them for as long as you own your home. The Masterpiece cabinets in this kitchen carry out the unique design without being “custom made.” This kitchen includes an island mounted on a chromed base, floating shelves on the wall, a wine storage tower and contrasting finishes. To get a kitchen like this could mean paying a lot of money to a cabinetmaker and then waiting until he can fit your job into his schedule. This could leave bruises on both your budget and your timetable. Instead, choose Masterpiece. It offers everything you need: the drawer cabinets for the island, top-hinged wall cabinets, floating shelves, glass doors, stacked wine storage and specially-finished cabinet interiors. These elements make a great foundation for the dazzling countertops, radical lighting and modern accent pieces shown here. Our staff at Carolina Kitchen & Bath has the training, skill and experience needed to make your vision into a reality. Talk to us and you’ll discover that with Merillat Masterpiece cabinetry, the only limit for your kitchen is inspiration and imagination. We can help with both.